While filming the first It film, director Andy Muschetti made sure to keep the kids away from Pennywise (Bill Skarsgård) when they weren’t filming so the diabolic clown would stay as terrifying as possible to them. However, now that Pennywise is a celebrity—and It: Chapter Two’s actors are adults—Skarsgård is thrilled he gets to sit at the grown-up table again. This time around, because the movie became such a phenomenon, it’s almost like I’m re-adapting myself. The character became very iconic. Pennywise became a star. You see Instagram posts of people dressing up or dressing their kids as Pennywise for Halloween. It’s all over the place. LeBron James was Pennywise. How surreal is that? So, it became this completely universal thing, outside of the thing. That’s not me. I can’t even relate myself to it anymore. And now that I’m going back and doing it, it’s such a bizarre thing. I don’t think I’ll ever really experience anything like it. It’s this dualistic thing of me and the work and the character, and then the thing that it became, but it’s fun. We had the read-through and I’ve done some rehearsals, and I was surprised how much of the character was just there already. I instantly could access him again, like it was yesterday that we wrapped the first one. It was just all there. 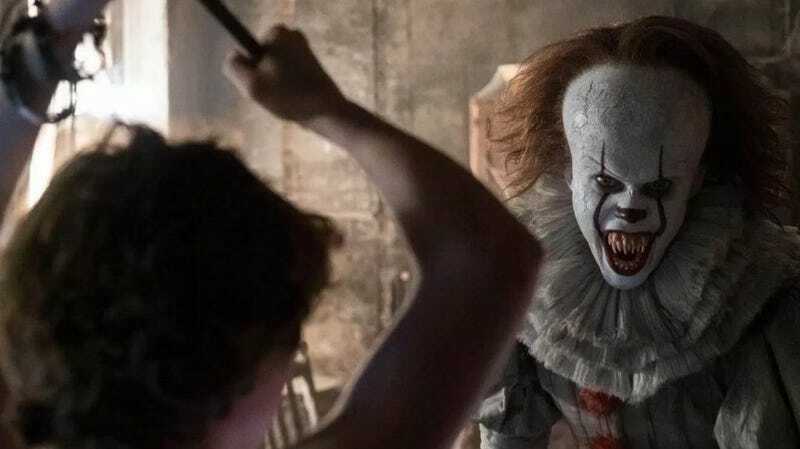 In a video published around the release of It, the producers shared how they worked to keep Pennywise’s look a secret from the kids. This helped get the kids’ gut reactions to Pennywise’s terrifying look and behavior, but Skarsgård didn’t get to spend much time with them or figure out their character dynamics. But now that the actors are adults, who’ve already seen Pennywise onscreen, he doesn’t have to worry about that anymore. And he said it makes a big difference—not only personally, but also for the performance itself. Off camera, I get to hang out with the entire adult cast now. It’s weird and it’s surreal because some of them are really big stars and they’re coming in to your thing. They’re stepping into the thing that me and Andy and the kids did. They’re joining the band, in a way. They’re excited, and I just had a lot of fun hanging out with all of them. It’s going to be a very different shooting experience with all adults, for sure, but it will be fun. They’re all really cool and talented people, so I think they will bring a lot to the table. It: Chapter Two is set to come out September 6, 2019. In addition to Skarsgård’s return, the later-in-life sequel stars James McAvoy (Bill), Jessica Chastain (Beverly), Bill Hader (Richie), James Ransone (Eddie), Andy Bean (Stanley), Isaiah Mustafa (Mike), and Jay Ryan (Ben).